As you can see from my recent posts, my collages are often inspired by the juxtaposition of a couple of stamps that have been discovered at random while sorting through a larger batch. By happy coincidence, they might have similar colours or other features in common that (in my head, at least!) contain the seed to grow a larger landscape. They are only starting points, and can often digress in directions I don’t anticipate. 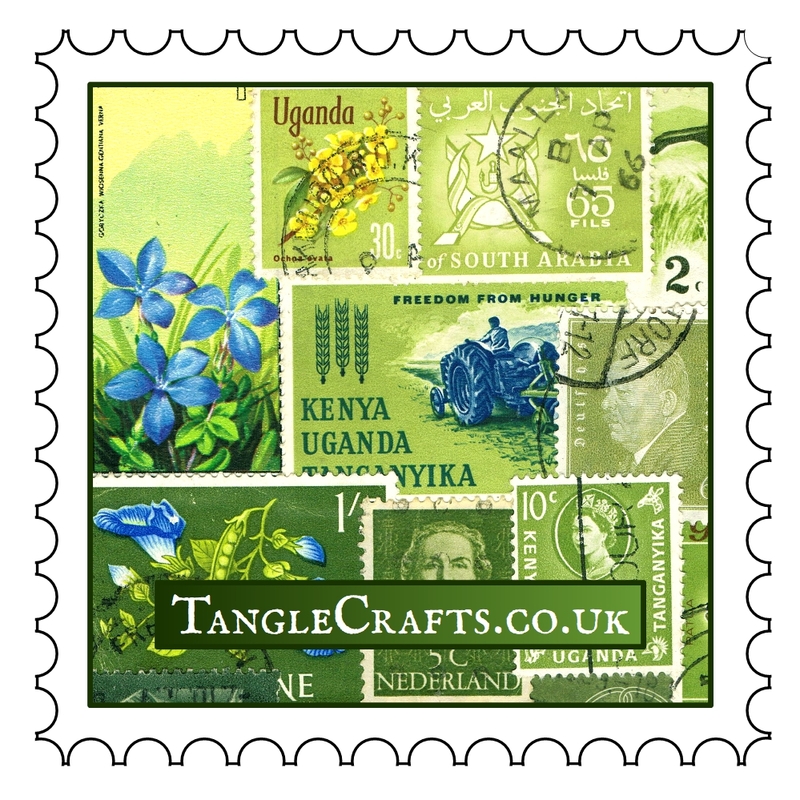 Sometimes the very stamps that inspired a collage don’t make it into the final piece! It might seem like it would be easy to choose stamps of complimentary colours, stick them down , and achieve a pleasing end result. To be fair, on one level, it absolutely is! But believe it or not, a small A6 composition can often take me days. For me ‘close enough’ is frequently not ‘good enough’. I have boxes full of stamps that I have sorted by colour to use as my palette. Sometimes I pluck out striking individual stamps or combination of stamps that seem to go well together – but finding the right blend to surround them and successfully bed them into position is a painstaking task. My palette boxes of stamps are only very loosely grouped, and individual stamps very quickly become buried as I rifle through or add a new, freshly sorted selection. I never know from one day to the next exactly what I will need, so it’s impossible to pre-empt & preserve all of the stamps that may one day be just the right shade or combination of shades to fill a gap in an as-yet unstarted jigsaw. Take a look at this: I knew from the initial juxtaposition of the 2 central stamps from St. Vincent which overall schematic I wanted the colours to follow. The first draft layout (above left) was actually far from a first draft and had taken hours of sorting, and switching different stamps in and out. It did literally take days of further contemplation and re-shuffling – taking everything off and starting again more than once – to reach the final destination of the finished design (above right). Even I was surprised when I realised quite how many (or in fact, how few) stamps from the original draft made it into the final piece! The first draft was approximately right, and I could quite easily have stopped there. But I’m far happier with the end collage, and glad that I took the time and effort to continue searching out just the right stamps to actualise and do justice to my initial vision. Click here to view full details for the journal above. Click here to view full shop.